Recently my local Arbonne consultant got in touch to ask if I would like to review some products and of course I said yes. The first thing I tried was the Intense Hydration Mask as I have been having problems with dry skin. The mask was good because it didn’t really dry in and a mask so dry that it cracks is really not what you want when you have dry skin. I left it on for 10 minutes, washed it off with warm water and noticed a real difference after just the first use. My skin felt a lot smoother and a lot less dry than it had been. I think if you have dry skin it really couldn’t hurt to give it a go. Once my skin was feeling a bit better I tried the CC cream and it was a little bit dark for my skin but not overly so. I could get away with it If I blended it well at my neck. It was actually a really nice colour that made me look like I had been away in the sun for a week or two but it wasn’t too orangey which was good. The eye shadow duo is a good little hand-bag extra, the brown is great for a smokey eye, it blends really well and it’s easy to remove. It’s inspired me to try a brown smokey eye. The vanilla wasn’t bad but it wasn’t anything to rave about either, just a normal eye shadow that does the job. I tried the hair serum twice because I didn’t realise the first time around just how little you need to use, seriously – a lot goes a long way with this stuff, once I got the hang of it it was quite good at smoothing down frizz, particularly when I was wearing my hair back in a pony-tail but you have to be extremely careful not to make your hair look greasy. I found putting a teeny tiny bit in the palm of my hand and rubbing my hands together before applying to my hair was the best way to get the results I wanted. I didn’t really notice a result with the lifting and contouring eye cream but I think maybe that it is meant for more mature skin, I have some dark pigmentation under my eyes but I don’t have puffiness or bags so there wasn’t really anything to lift or contour in the first place. The cream smells quite nice though and it comes in a lovely chic little pot that looks nice enough to leave on show somewhere in the bedroom or bathroom. 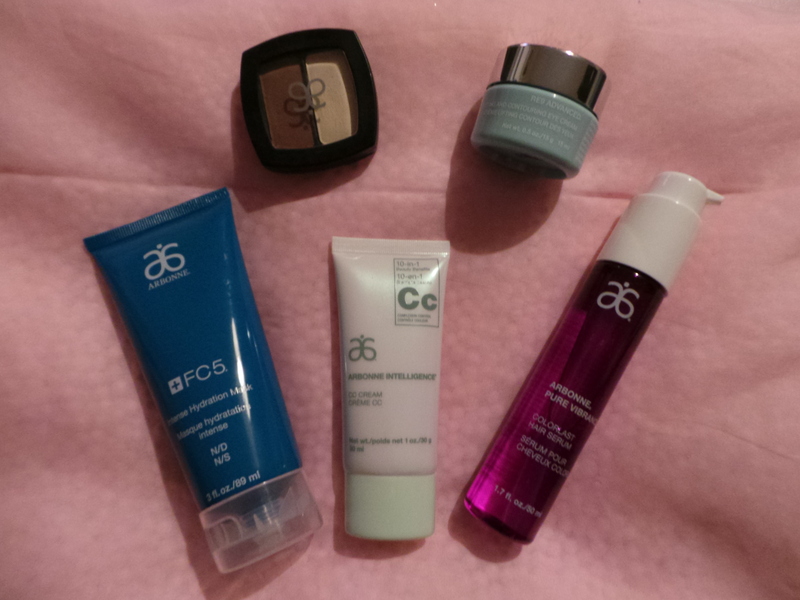 Overall I would say that if you like discovering new beauty brands you should give Arbonne a go because you just might find something you like. I’ve used my Intense hydration mask more than once and I’m very glad that Donna chose to send me this. Arbonne is a global brand and Donna can supply anyone in the UK, USA, Canada, Poland and Australia with products. Her details are below and her website link is also the place to find out the prices of everything I have reviewed.